I felt like making another sparkly something, so I put together this quick card. I punched the butterflies out of some glittery paper Pauline sent me. 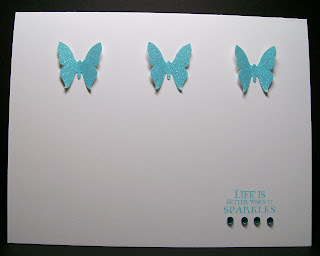 The Tempting Turquoise was stamped off once to make it light enough to match the butterflies. A few rhinestones were added for extra sparkle. It's really lovely, so fresh and crisp-looking. Well done. Great sentiment for this card! Very simply pretty! The butterflies and the bling are just so elegant. Where less is more. So sweet and simple, great layout. Wow! Love the elegant simplicity of this card! This is beautiful! I love butterflies and the symbolism associated with them! And this sentiment goes perfectly! Bright, clean and crisp! Adorable card! Love all the sparkle. I like these simple but elegant looking cards :) Great job!